You know food is an intrinsic element of culture—anytime people celebrate there are foods of some type attached to the occasion. Macaroni and cheese is one such dish at the Drapers. Not bragging, but folks have always enjoyed coming to the Drapers because regardless of the occasion, they knew there would be good things to eat. Several fam members have dishes they prepare that have morphed into their very own specialties. My sister is the one who cooks the least—you know there is one in every family but she can make very good macaroni and cheese. 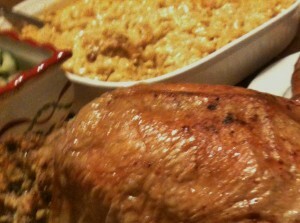 With turkey and ham on the menu, there’s always macaroni and cheese. For this holiday season she passed the mac ‘n cheese baton to me—mind you I am already committed to cook myself into a stupor and working December 23 and December 24. As things were at last coming into the final leg of this culinary marathon, I’m stirring elbow pasta, making sure it is al dente, beating eggs, shredding cheese, and spooning out Cheese Whiz® between checking the Butterball®—is it done? The oyster dressing is in another oven—did it finish cooking? The ingredients for the macaroni are done, blended and it’s baked—with golden, crisp corners on the very edge. We are almost there—when one of the kitchen elves raises a voice above the din—What’s the cheese in the microwave for? Oh no, well ok, maybe a few spicier words than that. Bring the mac back from the table—I’m staring at it. Ok Food Maven can you fix this? I punched the magic numbers into the microwave to melt the recent find, whipped out a favorite fork to break up the pasta’s perfect surface, poured the melted cheese over the macaroni and gently folded in the cheese sauce. Back into the oven for just a few minutes—it looked fabulous and tasted even better. Who knows maybe this culinary fix is the new gold standard for the must have it dish on the Draper dinner table. This culinary fix saved the day. Do you have a culinary fix? Share your recipe Rx with ChowChow and Soul. This Mac and Cheese story makes my mouth water! Thanks Courtney. It is one of my fav comfort foods.